In the winter of 1845, Frances Osgood is a woman in a precarious position. Disowned by her parents after marrying Samuel Osgood, a talented but profligate artist who abandons her and their three children, only her writing stands between her and absolute poverty. Her poetry, however, isn’t selling. If Frances can write a tale as good as The Raven, a “shivery tale for ladies,” he’ll buy it, he promises. In other words, he wants her to become a Mrs. Poe. Frances can’t envision herself writing such a story, though she reads Poe’s poem in hopes of getting inspiration. Her walk home through the streets of mid-19th century New York paints a picture of the city both intriguing, as well as repulsive. As luck would have it, publisher Henry Russell Bartlett and his wife are invited to a conversazione, the New York version of a salon. They take Frances with them. The conversazione itself is a celebrity compendium . . . John James Audubon. . . Horace Greeley . . . Matthew Brady . . . William Cullen Bryant . . . and Edgar Allan Poe. Frances expects a literary genius. What she finds instead is a man lashed with pain. Thus begins an affair that is carried on in exchanged poetry before becoming an actual fact. Frances is befriended by Virginia Poe, a woman by turns charming, childlike, vindictive, and threatening. She is also dying of consumption. Edgar appears uncomfortable in her presence but always hovers nearby. They are physically alike yet mentally miles apart while held together by some unseen bound. Their accidental meetings escalate into rendezvous. When Edgar praises Frances’s poetry, it starts the gossip mills churning. Poe invites her to his home, to the theater. Virginia is always in attendance, but it’s as if his wife is the chaperone and Frances the woman he’s courting. He visits the Bartletts, ingratiating himself with Frances’s children, a man playing at happiness with a pretended family. Like one of Poe’s stories, that love can only lead to tragedy. In this story, Poe himself doesn’t appear as much as one would expect, since it’s Frances’ tale from her POV. He’s in her thoughts more than he’s in her presence. 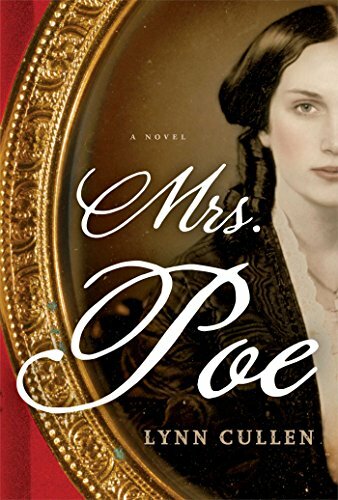 Nevertheless through her onlooker’s view and because of her involvement, Mrs. Poe is by turns a compelling story of star-crossed lovers, of a man reaching out to his mental soulmate, and of a literary genius who might have become famous for another genre of writing with the right woman at his side. Many of the events are tied with and related to Poe’s short stories and poems. It’s a sympathetic and ironic rendering of a portion of Poe’s life that may or may not have some basis in fact or is possibly simply an intriguing fiction.